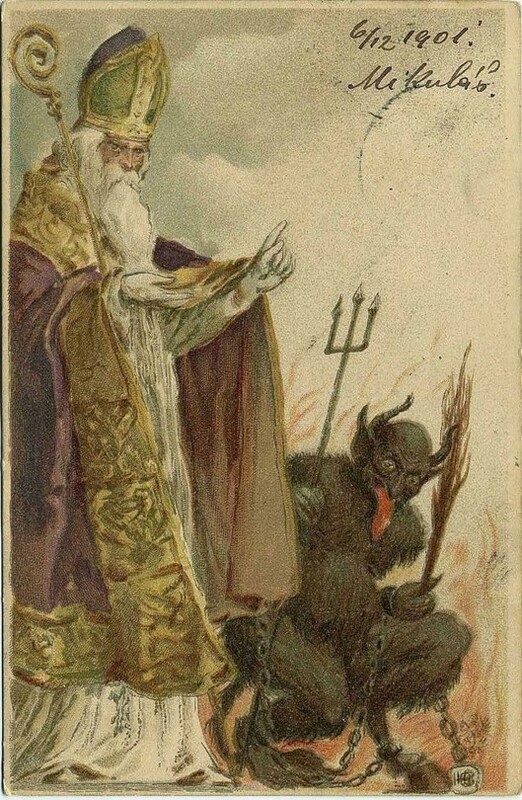 A St. Nicholas Christmas card, dating from around 1901. Cards displaying both St. Nicholas and Krampus were rare among the Christmas cards; this may be because cards depicting just St. Nicholas were usually of a more thoughtful and religious presentation, while cards with just Krampus were usually humorous or shocking in nature... hard to make both those ideas work together on one card! This card also has its Krampus carrying a trident, which is a very odd thing for him to be holding... but was a typical object for the Biblical Devil to be shown holding in illustrations; so again, the two monsters are being mixed.